What's the best way of treating the outside of this fiberglass boat? If there's a waterproof, flexible paint that's easy to apply I'd rather do that than gelcoats which I have no knowledge about. The closeup picture is the outside which feels like the coating has gone completely. The inside needs rubbing down and painting too as the paint is flaking off. I used 2 pack International Perfection on the bottom of a topper which the kids had about 12 years ago it worked very well and looked good 5+ years when we sold the boat. Gave it all a good sand with an electric sander I think 120 wet and dry, to get a matt clean surface, before painting. Is that some sort of flexible 2 pack for fibreglass boats? Sail Life on youtube has a fibreglass boat, he uses West System Epoxy manual. The PEELWRAP looks good. Thanks. Any views on this? It seems simple enough to use - undercoat and topcoats. I have just sheathed a plywood boat with epoxy glass and finished it with a coat of resin covered with peel ply. The peel ply just pulls off leaving (in my case) a slightly textured surface that needed filling and sanding to get it really smooth, but it wouldn't be necessary for a dinghy. As suggested above, prepare the surface, then apply a coat of epoxy, apply the peel ply and roller it in. Next day (if the conditions are right for curing) pull off the peel ply (which is like a greasy woven nylon cloth). Thanks but it sounds too involved and to expensive. I don't really want to start resin coating it. I just want something I can paint on, job done. 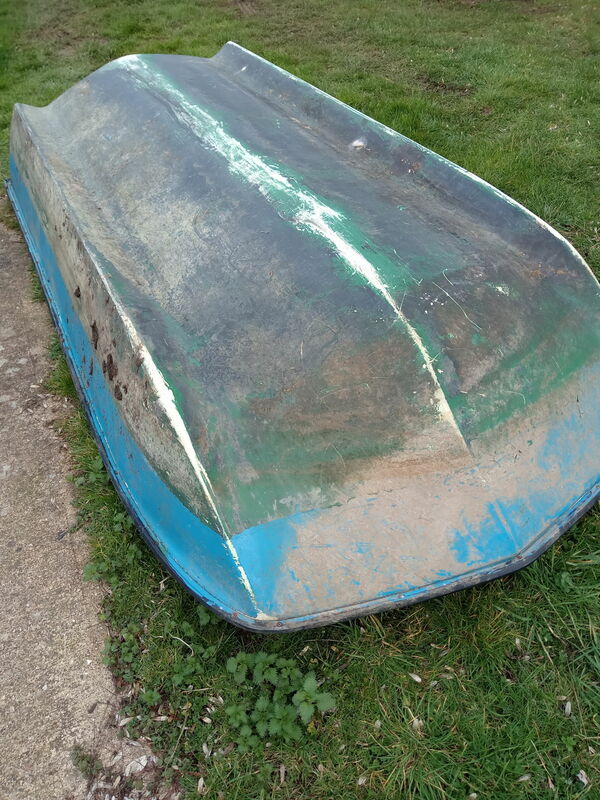 The fibreglass on the dinghy is fine, it just needs a coat of something. I think I'm going to use the Supplyshed paint I posted the link to above. It is epoxy coating and not resin coating. If you want a shiny finish instead of peel ply you can use an acrylic sheet or there is a special peel ply which is brown which leaves a smooth shiny surface when removed. For a knock about GRP dinghy I'd just use a single Polyurethane paint after a light sanding. Sail Life ﻿on youtube has a fibreglass boat, he uses West System Epoxy manual. The PEELWRAP looks good. I tried to look it up on Youtube but there are loads of Sail Life videos and I couldn't find the correct one. Anyway, I found these instructions on peel ply but it seems to involve adding fibreglass which isn't what I want to do? I'm a bit confused about what peel ply actually is and how it's applied. Epoxy is a type of resin isn't it? Epoxy resin? We used to fix up GRP dinghies as kids, then wreck them again. If the gelcoat had deteriorated so that the matting was exposed, you could get gel coat repair paste that you treated these areas with (think Plastic Padding made a version.) sometimes we used car body filler for very small areas. After that it was rub down and paint, using anything that we could liberate. Never did anything very technical and they all floated and looked the part. A lad had a grp dinghy in our marina that he found on top of a skip. He slapped some ex WD army green paint on it. It came out really well. So no glass fibre matting involved? I can only think that you roller on the epoxy and then add the cloth? I'm not after any particular finish so what would be the point of the cloth exactly - why can't I just paint on the epoxy? Could I paint the epoxy after that? That's what I was thinking in the first place. If peel ply is easy and not too expensive to do I might give it a go, but not if it means adding matting. So no glass fibre matting involved? Peel ply is just a release fabric. I reckon your dinghy though just need a clean, rubdown and stick the most cost effective paint you can get hold of. It won't last many years before it will need doing again though. No I don't want to. The dinghy is thick and heavy enough as it is. Thanks, so if I want to epoxy coat the outside it looks like I don't need peel ply at all as all that's doing is giving a surface finish that I'm not interested in? I could just prep the surface, add a couple of coats of epoxy and then a couple of coats of compatible paint to finish it and give it some UV protection? Have you tried a pressure washer on it to get the muck off? I personally wouldn't bother with the expense of epoxy unless the gel coat has been compromised. What does the inside look like? No I only got the dinghy back to the boat today. I was my only dinghy on the Avon. I'm going to pressure wash it asap. It needs a few repairs inside as the double hull is leaking from the inside meaning it was full of water. I've drained all the water out now so I'm just going to let it dry out and whack some Stixall in to fix the holes. I was even thinking of filling the space between the hulls with expanding foam, but I'd probably just end up tearing the thing apart so I'll scrap that idea. The inside paint has all peeled off so that needs redoing too and the guy who had it lost the internal deckboards so I was planning to get a pallet or two and cutting them to size for the inside. I've just worked out that this kit of epoxy would give about 6m2 coverage so only really enough for one and a half coats over the outside. I think two coats would be too expensive so I'll scrap the epoxy idea too and just paint it. The dinghy is polyester resin so any work with epoxy needs to be careful with cleaning and quantities. Just seems overkill really. Is this one of those 'Ace' dinghies about 8' and double skin so weighty? I had one with holes where a wooden skeg had been attached. Rubbed that area back on outside, filled holes with Sikaflex, a few long lines of glass mat and polyester resin and then just used black gloss paint below the waterline. It did the job and looked reasonable enough for an old dinghy. 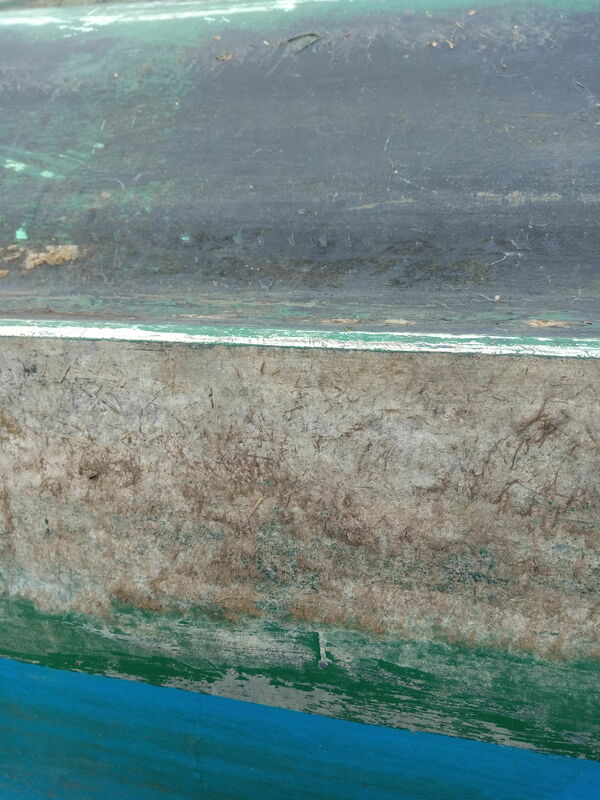 I know the gelcoat is the key barrier but so many old smashed and battered dinghies full of chunks out of the gelcoat are still in use without any repairs. It will begin to compromise the GRP beneath but pretty slowly. West epoxy is always expensive. Cheaper epoxies are available, but still overkill imo.